For measurement and display of both the current wind speed and the mean wind speed (over 120 seconds and 300 seconds), the PCE-WSAC 50-811 is an ideal anemometer. Measurement of the slightest of wind motion is achieved by this sensitive instrument. The PCE-WSAC 50-811 can be applied to multiple wind monitoring applications in building and maintenance, agriculture and aviation and many other industries. Anemometer with port, memory, software for wind speed, temperature and air flow. All the test instruments come manufacturer calibrated. ISO certification can be made as an option. This anemometer is very economical. With this anemometer you can measure wind speed and air temperature. Both the present wind speed and the average wind speed of the preceding two and five minutes are shown on the PCE-WSAC 500-820 anemometer. The large measurement range of the device is 0 to 110 mph. The PCE-WSAC 500-820 anemometer is suitable for use across a whole range of industry sectors, including shipbuilding, petroleum and defence. The PCE-WSAC 50-821 anemometer can be successfully applied to various wind monitoring applications. The instrument clearly displays the prevailing wind speed and additionally the average wind speed over 2 and 5 minutes. The slightest of wind movement is detected by the PCE-WSAC 50-821 anemometer. Aerospace, recycling plants and fruit production are some example areas that can benefit from the device. The anemometer PCE-WL 1 is an ideal tool to measure and store the wind speed over a long period of time. 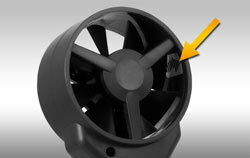 The battery operation enables you to use the anemometer for mobile applications. Since a wind power station is an expensive investment, you usually want to know what profits it will generate in advance. The anemometer PCE-WL1 helps you determine these profits. 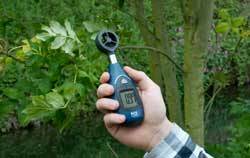 The Anemometer PCE-WL 1 is an ideal tool to measure and store the wind speed over a long period of time. The battery operation enables you to use the anemometer for mobile applications. Since a wind power station is an expensive investment, you usually want to know what profits it will generate in advance. The Anemometer PCE-WL 1 helps you determine these profits. A strong wind is not esssential to use the PCE-WSAC 50-910 anemometer, as it has a measuring range of 0 to 110 mph. In addition to the actual wind speed, this versatile anemometer can display the average wind speed over the last two minutes and five minutes. The PCE-WSAC 50-910 is suitable for numerous wind detection applications in outdoor industries, e.g on construction sites. If your situation requires monitoring of the wind speed and the average speed figure over 2 minutes and 5 minutes, the PCE-WSAC 50-911 is the right anemometer for you. The device handles wind speeds from 0 mph to 110 mph. Multiple types of outdoor industry can benefit from the PCE-WSAC 50-911 anemometer, for example construction, agriculture and wind energy. The PCE-FWS 20 Anemometer Station is a multi-functional wireless digital device that will exceed your expectations. This manufacturer-calibrated meteorological instrument accurately measures temperature, relative humidity, precipitation, atmospheric pressure, wind speed and wind direction. Featuring a free-standing or wall-mountable touchscreen LED display with backlight, the PCE-FWS 20 makes a fantastic gift. The Anemometer combines various functions and sensors in only one instrument: Air Humidity Meter, Wind direction, Wind speed, Temperature meter, rainfall, and data logger. Furthermore, the meteorological station has different alarm functions and settings for the measurement parameters. The measured data can be sent by radio to the base unit (max. distance of 100 m). This test instrument is equipped with the latest technology used in meteorological analysis. The touch screen allows you to recall data onto the screen easily. The PCE-FWS 20 Anemometer is for private and professional use. This meteorological station allows the accurate detection of wind direction, wind speed, temperature, relative humidity and precipitation. The USB port and the included cable allows transmission of data from the device to a computer. Software for analysing data is also included, which enables you to analyse and check meteorological fluctuations, presenting data in graphs and diagrams for measurements over prolonged periods of time. The PCE-WSAC 50-920 anemometer shows the speed of the wind and also the average figure over the prior two minutes and five minutes. The smallest wind motion is detected by this accurate anemometer. The timber industry, the mining industry, and the construction industry are some examples of applicable wind monitoring application areas for the PCE-WSAC 50-920. The PCE-WSAC 50-921 anemometer is used in a multitude of wind monitoring situations. Besides the actual wind speed, the average wind speed across 120 seconds and 300 seconds is presented. The lightest of wind movement is detected by the PCE-WSAC 50-921 anemometer, and the instrument can be helpful across the full spectrum of outdoor industries. The PCE-TA 30 Anemometer can measure air velocity, air temperature and air flow. 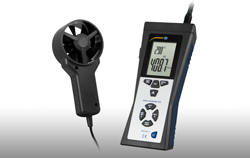 The PCE-TA 30 Anemometer shows measurement values in its large backlight LCD display. The Anemometer shows the current value on the display as well as max. and min. values. Without a doubt, the main advantage of this handheld cup vane Anemometer is that it doesn't need to be held exactly in the direction of the wind. Anemometer with impellers typically have to be held exactly in the direction of the air flow to take accurate measurements. Digital cup vane Anemometer, wind direction will not influence the measurement. PCE-EM 888 is a portable handheld anemometer ideal for monitoring environmental conditions and the performance of heating, ventilation and air conditioning (HVAC) systems. This multifunctional digital device is used to measure wind speed, volumetric air flow, temperature, relative humidity, light and barometric pressure.